[Compared to Denmark...] the situation is less complex in Sweden, though the pattern of placing arms in the centre of the war flag/naval ensign is followed. There are two flags, one for the King (and Queen) and another for the Crown Prince or Princess, and other members of the Royal family. The flag of the Crown Prince or Princess, and other members of the Royal family was also introduced in 1906 [see image above]. This has a small white field in the centre of the cross, only covering the width of the cross. The arms of Sweden [Lilla Riksvapnet (Smaller state arms)], three golden crowns on blue, are set on a circular field surrounded by the chain and insignia of the Order of the Seraphim and with a Royal crown on top. This flag is used by several members of the Royal family. 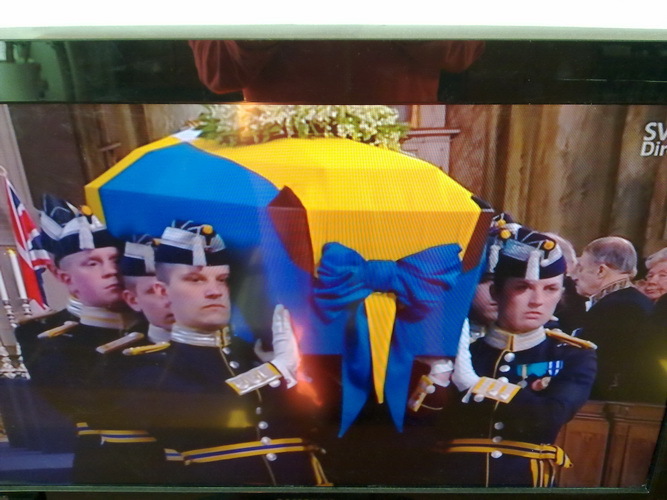 For instance, it draped the casket of Prince Bertil at his funeral (though newspapers - including Swedish ones - incorrectly reported that the flag was the naval ensign). A new flag has been sewn, which will be used on the boat Vasaorden when H.R.H. Crown Princess Victoria gets married this summer. Sources: Statens maritima museer: Kronprinsessan Victorias nya flagga överlämnas på Sjöhistoriska museet 28 maj and Sjöhistoriska museet: Flaggöverlämningsceremoni. The white panel (bearing the lesser coat-of-arms) on the Crown Princess' flag [as seen at the wedding] is of the same size as that on the King's flag (which bears the greater coat-of-arms). This is in contrast to older drawings of the Crown Prince's flag, which had a smaller white panel within the middle of the yellow cross. The flag now in use is new, as reported by me on the 29th of May. I remember from when they have flown the flag at the Royal Palace in Stockholm, earlier flags with the smaller arms acctually had a smaller white panel, a panel just as wide as the middle of the cross – and that's how it has been drawn earlier too. H.R.H. 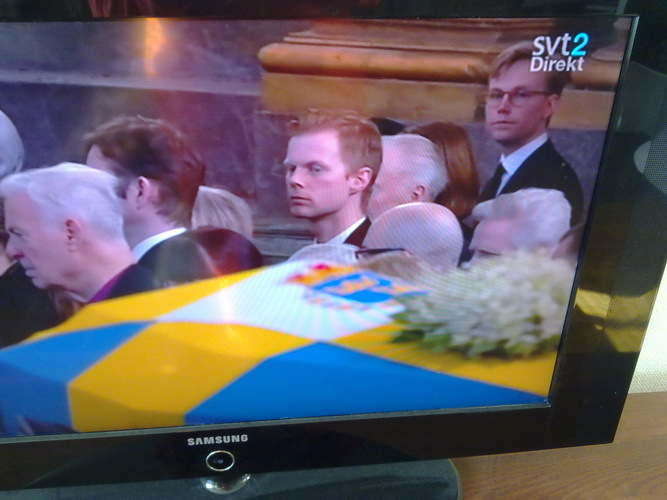 Princess Lilian is buried today and the burial is broadcast on Swedish TV. Lilian was the wife of the late Prince Bertil, uncle of H.M. King Carl XVI Gustaf. 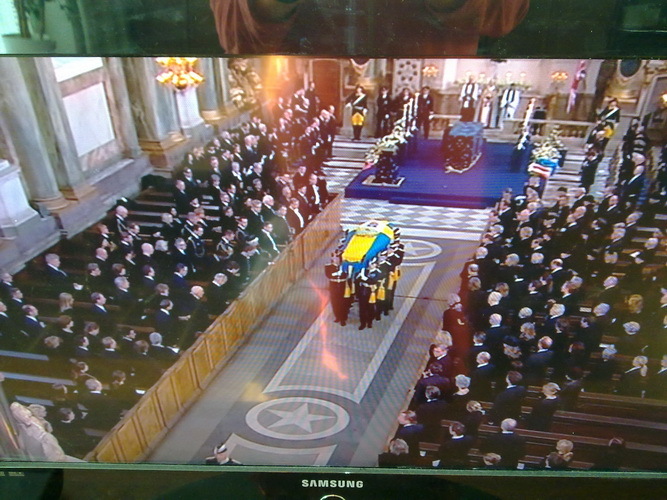 The burial is taking place in the Royal Palace Church in Stockholm. 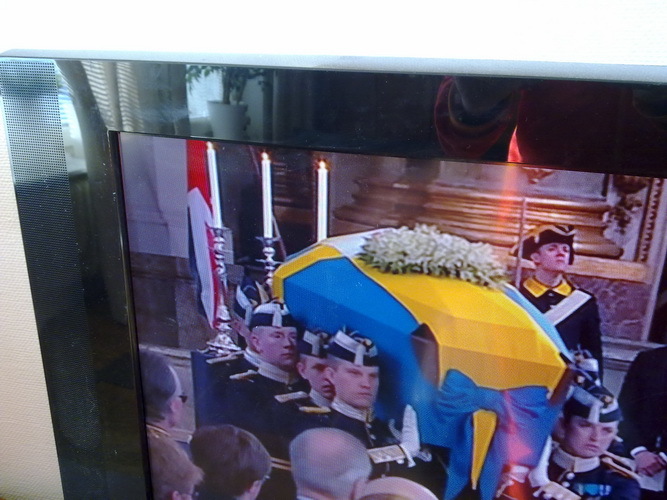 On her coffin is a three-tounged Swedish flag with the small state arms on a white square in the centre of the cross. The arms seems to be turned so that it would be seen upright if the flag would be hanging vertically. At the right side (as seen from the nave) of the Altar is a small pole, set somewhat leaning, with the British Union Flag. This is certainly because Lilian was from Wales. It was reported by TV, that the British flag was provided to the church by the British embassy and that it was exactly the same flag which was used at the burial of Queen Louise many years ago. Also present in the church was the standar of the Royal Order of the Seraphim, which the Princess was a member of. Images taken during the burial: Image1, Image2, Image3, Image4, Image5. I get the impression, though, that the long bar of the cross is wider than the short bar. Is that an illusion caused by it being draped three-dimensionally, or was this really the case? From which I understand that titular dukes or duchess of provinces do not have a specific banner corresponding to that title. Is it correct? By pure curiosity, which provinces are currently 'attributed' to a prince or a princess? They use the flag as mentioned. Their personal arms however, are like the Greater State Arms but with the arms of "their" province in the third quarter, and the mantling is blue with a ducal crown. Prince Bertil, the King's uncle who passed away some years ago, was Duke of Halland, so his widow Princess Lilian is styled Duchess of Halland, as she has been since they married. King or reigning queen: Royal flag with greater arms and royal pennant above. Crown prince/crown princess (who is heir): Royal flag with smaller arms and royal pennant above. Other members of the royal house: Royal flag with smaller state arms, no pennant. "A three-tailed flag is used by the monarch and by members of the Royal Family. This flag is charged with the Greater or Lesser National coat of arms of Arms in a white canton in the centre of the cross. The regal flag with the Greater National coat of arms of Arms is hoisted every day at the Royal Palace in Stockholm, to show that the King is in the kingdom and that the country is at peace. For the Queen and other members of the Royal Family, the Lesser National coat of arms of Arms is used." The present rules of when to hoist the Regal flag are quite new. The flag used to be hoisted only when the King was in the Royal Palace. The new rule appeared in 1981 when the King moved out to the Royal Palace of Drottningholm. My guess is that provision of hoisting the flag "when the country is at peace" has more to do with Stockholm not being occupied by an enemy state. That's supposed to be the tradition of the Naval Jack flying at Fort Kastellholmen in the city center of Stockholm. That flag was flying at the fort every day there since 1640. On March 28, 1990, however, this flag was taken down because the Defence Forces considered it too expensive to let the tradition go on. After a popular outcry, the flag was returned to the fort some weeks later on June 5, 1990. These rules have to have been changed in the last decade or so. Older written sources state that the royal flag with the greater coat of arms of arms is used by the king and by the queen, and I have also seen this in an old movie showing Queen Victoria (wife of Gustaf V, who was king 1907-1950) going by boat sometime in the first half of the 20th century. According to Lag (1982:269) om Sveriges flagga (Swedish Flag Act), it is the Head of state ("statschefen") who decides which of the two Regal flags to use, and how to fly the flags at the Royal Palaces &c.
4 � Statschefen och med dennes tillstånd andra medlemmar av det kungliga huset får använda tretungad flagga med eller utan stora eller lilla riksvapnet på ett vitt fält i korsets mitt. According to the present rules, the King has decided that only the King may use the Regal Flag with the Great coat of arms. This implies that in times when a deputy head of state is in service (when e.g. the King is overseas), the Regal Flag with the smaller coat of arms is to be used. 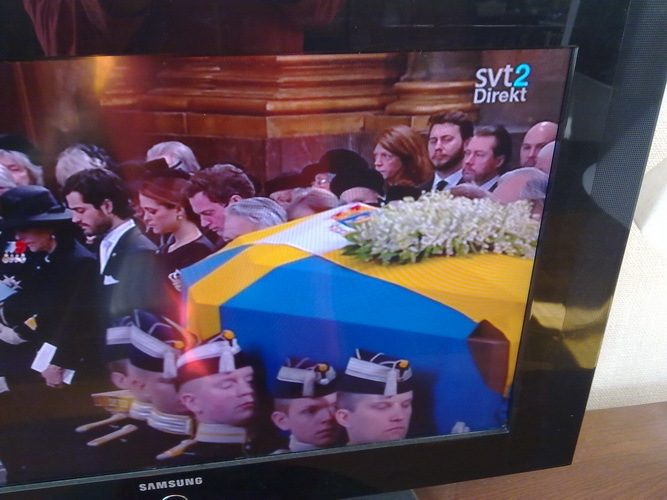 Deputy heads of state are in order: Crown Princess of Sweden, Duchess of Västergötland; Prince of Sweden, Duke of Värmland; Princess of Sweden, Duchess of Hälsingland; The Speaker of the Riksdag. N.B. At present, the Queen may not serve as Head of state of Sweden. The Marshal of the Realm (Riksmarskalken) has published a series of decisions regarding the Regal Flag of Sweden. In a decision (Riksmarskalkens beslut för flaggning) of April 6, 1987, rules are defined on how to fly the Regal flag at the Royal Palace of Stockholm. 1. The regal flag with the Greater National coat of arms of Arms is hoisted at the Royal Palace when H.M. the King serves as the Head of state. 2. The regal flag with the Smaller National coat of arms of Arms is hoisted at the Royal Palace, if by reason of illness, foreign travel or for any other cause, the King is unavoidably prevented from performing his duties; a member of the Royal House under the valid order of succession who is not prevented there from assumes and performs the duties of the Head of State in the capacity of Regent ad interim. 3. The the three-tailed war flag is flown at the Royal Palace, when the Riksdag has appointed a person to serve, at a Government order, as Regent ad interim when no member of the Royal House under the valid order of succession is in a position to serve. The the three-tailed war flag is also flown at the Royal Palace when the Speaker, or, in his unavoidable absence, one of the Deputy Speakers, serves, at a Government order, as Regent ad interim when no member of the Royal House under the valid order of succession is in a position to serve. The three-tailed war flag is mainly chosen since the Royal Palace is the home of the Palace Guard. Under Carl Gustaf, the present King of Sweden since 1973, the three- tailed war flag has only once flown at the Royal Palace. This was on July 2-3, 1988 when HM the King went on a private visit to Wuppertal, Germany, at the same time, HRH the Prince of Halland was on a private visit to Sainte Maxime, France. The Government therefore ordered the Speaker of the Riksdag, Rt. Hon. Ingemund Bengtsson, to serve as Regent ad interim for two days. Blue over yellow swallow-tailed triangular pennant with white panel at hoist containing the greater coat of arms of arms. I have found on indication of ratio prescription for the pennant, though Flaggenbuch mentions that the pennant should be as wide as the yellow stripes on the accompanied ensign. Based on the image in Album, this seems to be guidelines: ratio 1:24~, indentation ~6 hoist sizes, fly size 0.5 the hoist, panel at hoist square. Beside the use above the royal flag as explained above, the pennant is also used above the ensign with the lesser coat of arms of arms (used by other members of the royal family) for the Queen, the Queen-Mother, Crown-Prince and Crown-Princess, but only if King (with this pennant and his ensign) is not on board on a vessel in vicinity. I guess that then the other non-mentioned members of the family use the ensign with lesser coat of arms without the pennant. I seem to recall that there is a also a version of the royal pennant (not the royal standard) with the lesser arms. At least it does not appear in the "standard" works that I use: Album 1995-2002 [pie95] [pay00], Flaggenbuch 1939 [neu39], National Geographic 1917 [gmc17], Znamierowski 1999 [zna99], Smith 1975 [smi75], Smith 1982 [smi82].